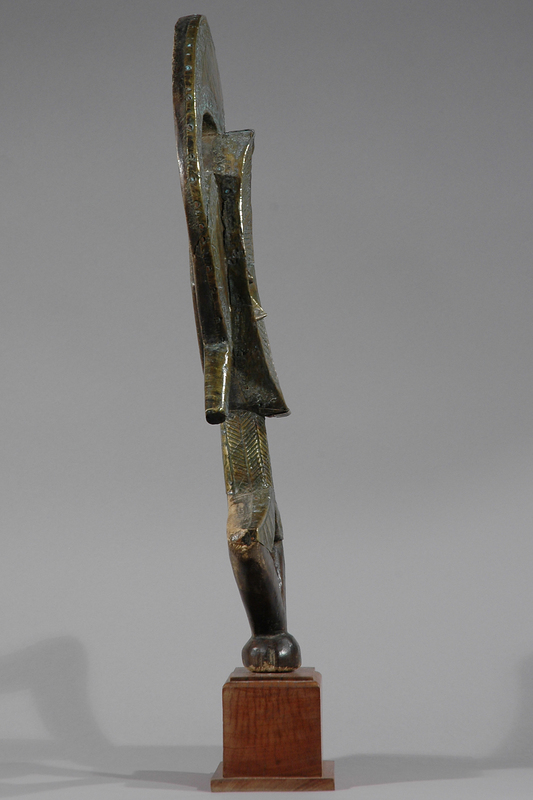 Figures like these were mounted on containers holding relics of important clan ancestors, serving as guardians. 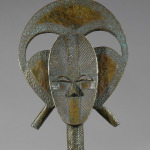 Two-dimensional and sheathed in metal (brass or copper), the figures include projecting shapes around the face that refer to elaborate coiffures, and a diamond shape below the neck that is an abstracted body form. 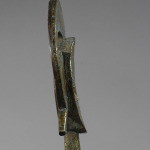 The name Kota describes many cultures in the Ogowe river basin. Among others, tribes of the Mahongwe, Tsogho and Fang live here. According to their customs the Kota people used to leave their dead unburied far from the village, in the forest. However, under the influence of their neighbours they beagn to bury them. Bones and the skulls of chiefs (after they were exhumed) were placed in special boxes (the ‘Byeri’ boxes used by the Bwiti secret society among the Fang people) or baskets (the ‘Bwiti’ or ‘Bwete’ baskets used by the Bwiti secret society in the Tshogo tribe). Reliquary figures were placed inside or on top of those boxes or baskets with ancestral bones and kept in special huts on the outskirts of the village to ward of evil spirits. However a close contact between the living and the spirit world was always the main aim of funeral rites and ancestor worship,. 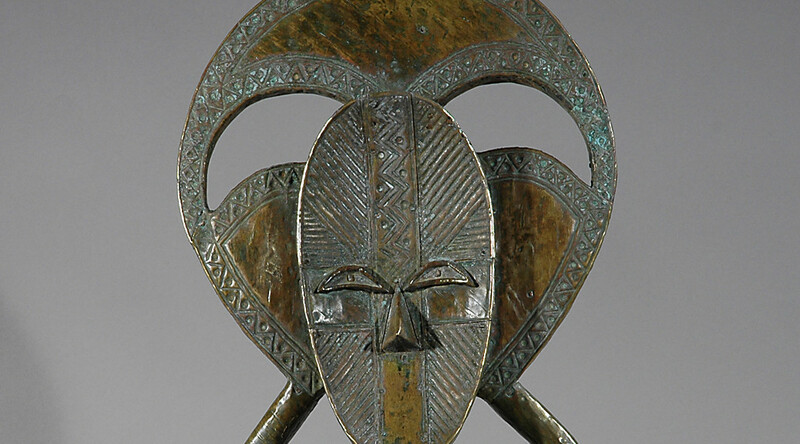 According to the beliefs of equatorial African tribes .. “life was only a passing and incomplete feature of a cosmic whole” (Laura Meyer, Black Africa – Masks, Sculpture, Jewelry. 1992). 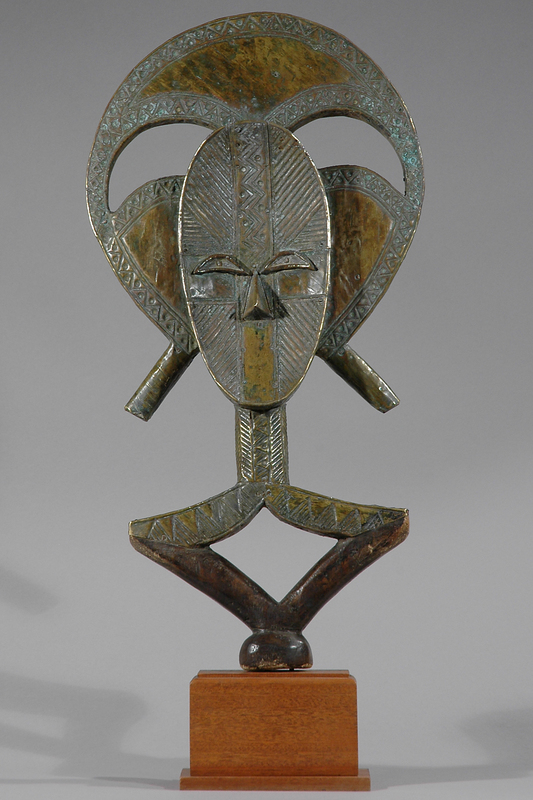 One of the most abstract reliquary objects is the “Mbulu ngulu” (meaning “the image of the dead”) reliquary guardian. 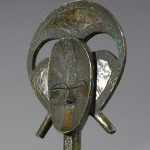 It has a flat wooden face, set on a disproportional long neck, surrounded by the oval crescent representing hair. 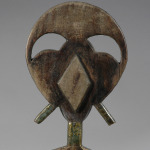 This part of the figure could also be considered as a halo representing the spirit, which now occupies the figure. The mouth has been eliminated, showing how difficult it is to communicate with the spirits and, perhaps, that there is no message from the other world. The nose which is reduced almost to a blade and round eyes are the only features of the unusual face. It is not clear weather the bottom part represents arms or legs, however a body form around the diamond shape is evident. 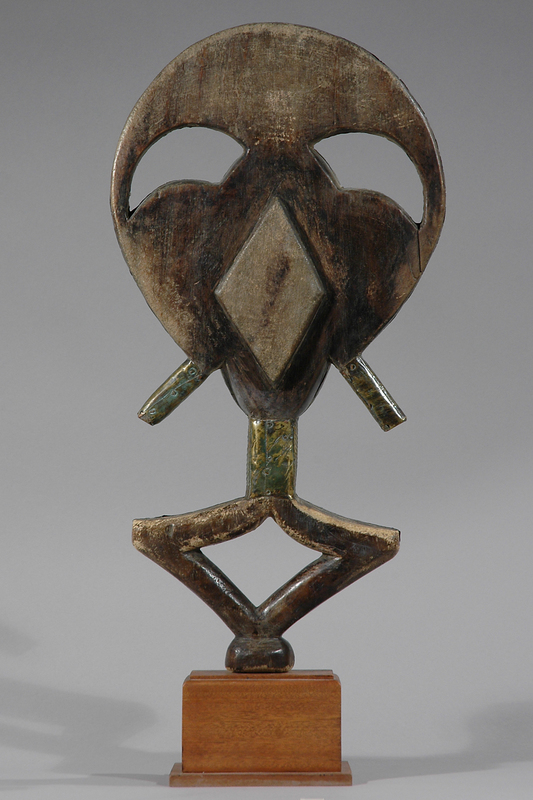 These very rare almost abstract, geometrical figures, found only in Gabon, are made of wood and ornamented with bronze (which is a symbol of daylight) plates and strips. Regularly rubbed with sand, they gleamed (for better psykological impact) in the dark during nocturnal ceremonies. Old, i.e. 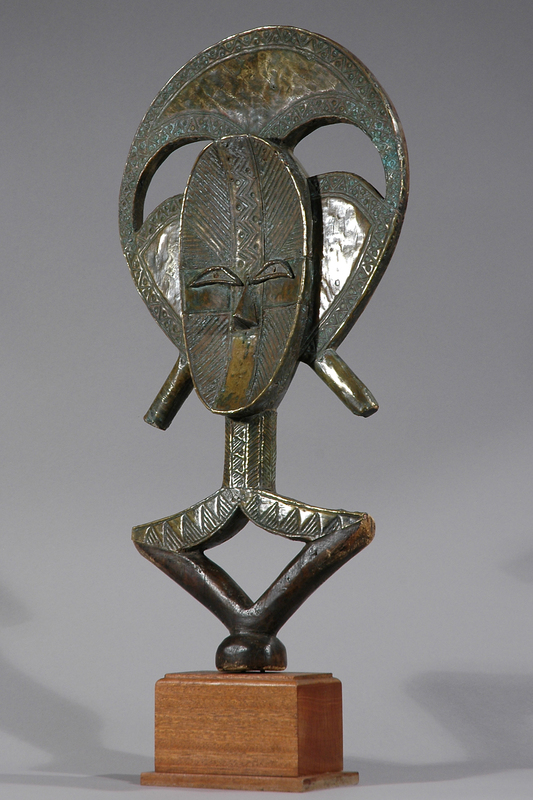 mid to late 19th Century, ‘Mbulu ngulu’ reliquary figures are very rare and among the world’s greatest African art treasures and some items reach very high prices (US$ 35.000-50.000) at the international auctions. Age: mid. 20th Century and in very good condition.